I check email once or twice a day. If you need to reach me sooner, please call or text the number above. Otherwise, send me and email I'll get back to it in a day or two. If you don't hear back from me within a week, please write again: sometimes a lot of messages arrive at the same time and I get stuck on those that demand an immediate response. I am an intellectual and cultural historian of Europe, with special interests in the history of science, scholarship, and religion from the Renaissance through the Enlightenment. I am currently Professor of History at the University of Massachusetts Amherst, and Chair of the History Department. 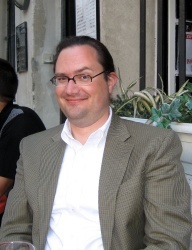 I have previously served as Graduate Program Director and Associate Chair/Scheduling Officer in History, as Co-Director of the Digital Humanities Initiative in the College of Humanities and Fine Arts, and as Director of the university's Oxford Summer Seminar. I am engaged in several research projects in cultural history and the history of science. I teach Renaissance and early modern European history, history of science, and history of religion. You can also see my profile for the history department and my curriculum vitae (PDF file). 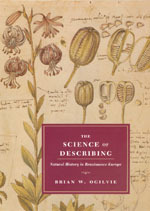 My book The Science of Describing: Natural History in Renaissance Europe was published on June 1, 2006, by the University of Chicago Press. It has been favorably reviewed in Nature (PDF file), TLS, New Scientist, and a dozen academic journals. It received honorable mention (2nd place) in the History of Science category in the Association of American Publishers’ 2006 Professional and Scholarly Publishing Division Awards for Excellence (see the AAP's press release). A paperback edition was released in March 2008. See a list of online and print resources for research in Renaissance and early modern European history (UMass oriented). Grad students: copies of two of my graduate school CVs, one from 1995 and another from 1996, are available in PDF format for your reference as you prepare for the academic job market. I have also written a brief introduction to history as a profession. Colleagues: material from my June 2004 presentation at the tenure workshop sponsored by the Center for Teaching is available here. History is an angel being blown backwards into the future. History is a pile of debris, and the angel wants to go back and fix things, to repair things that have been broken. But there is a storm blowing from Paradise, and this storm keeps blowing the angel backwards into the future. And this storm is called Progress.